American Eagle Silver Proof Coins are collector versions of the official United States bullion coins and are only available in the one ounce size. American Eagle Silver Proof Coins are currently minted at the United States Mint at West Point bearing the "W" mint mark. 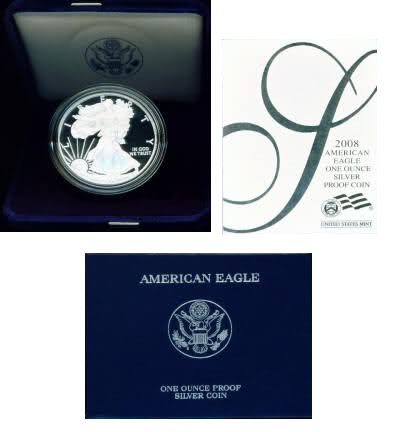 The American Eagle Silver Proof Coin contains 99.9% silver. The one ounce coin has a $1 face value and is 1.598 inches in diameter, contains 0.999 silver troy ounces and weighs 1.0000 troy ounces.